While researching Wilbur H. Durborough's World War I feature film On the Firing Line with the Germans (1915) we came across an interesting collection of contemporary German war films at the National Archives in Washington, D.C. Among the scenes not only was lost footage from Durborough's movie but a lot more historical film on the First World War. The Durborough film scenes were found in a five-reel Signal Corps collection which seems to have been assembled during the Great War. The U.S. Signal Corps apparently considered these films valuable enough to add to its archives, if only for military intelligence purposes. As a result, we were able to retrieve quite a number of pictures from Durborough's World War I film, notably scenes showing the Imperial German family, the American reporters at the Hotel Adlon in Berlin, prisoners of war at a POW camp in Doeberitz, Germany, and a substantial number of scenes that were shot by Durborough and his camera assistant Ries on the invasion of East Prussia by the Russian army. Reel 1, Crown Prince William reviews Army units. Gen. von Hindenburg poses. Cavalry, artillery, and wagon trains move through Berlin; troops entrain. Heavy artillery pounds Antwerp. Infantrymen don packs. Reel 2, supply trains enter an East Prussian town. Soldiers load refugees into wagons. Shows a German railroad gun. German trenches at Somme, France, are shelled. Fort Conde, near Soissons, is entered; cavalry units pursue the fleeing French. Reel 3 shows machine guns firing. Belgians surrender cows to German troops. An airplane is loaded with bombs, flies over trenches and Verdun, bombs a British G.H.Q., battles Allied planes, and lands at its base. Reel 4, German troops pass and the Kaiser inspects captured British tanks near Cambrai. Italian prisoners are captured in the Tyrol sector. Reel 5, French prisoners are taken to the rear. Prisoners march, bale hay, and dig rocks in a prison camp. Turkish troops place their wounded on camels. Camels and horses are watered in Turkey. We have uploaded these German war films on our YouTube channel. In 2011, authors Ron van Dopperen and Cooper C. Graham published an article for Film History journal on cameraman Albert K. Dawson. The paper examines Dawson's experiences during World War I based on excerpts from his published diary and other documentary sources, as well as portions of his films recently discovered in the Library of Congress's John E. Allen collection. Albert K. Dawson in camp before Przemyśl, May 1915. 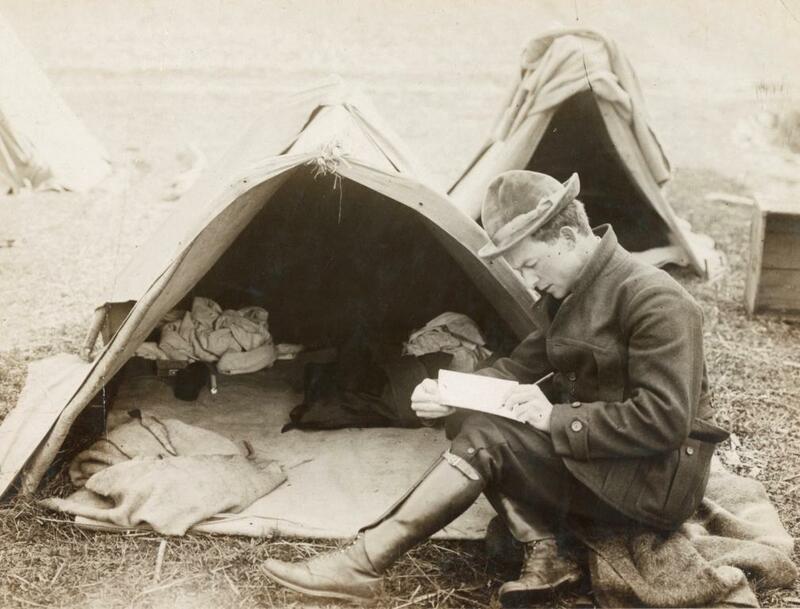 Photo reproduced from the collection of the National Archives in Washington, D.C.
Our discovery of Dawson's war diary was an extraordinary opportunity. We knew he kept a notebook on his film adventures during World War I. And just when we thought we would never find it, parts of his diary were located in the magazine Deutsch-Amerika. In a series of five weekly articles the magazine ran a feature story on Dawson's experiences as a cameraman, following the trail of the German and Austro-Hungarian army in the summer of 1915. The decision by the editor to publish parts of his war diary is something to be grateful for because it provides us with a unique source for World War I film history. It also gives us the opportunity to witness a major military campaign on the Eastern Front, as seen through the lens of an American camera correspondent. The historical significance of Dawson's war diary is confirmed by Oswald Denkmayr in his study Kurbelmann in Kriegsdienst (2012) on the Austrian World War I cinematographers of the KuK Kriegspressequartier. 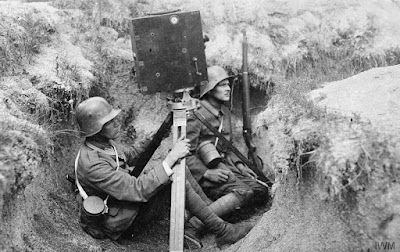 According to Denkmayr, Dawson's notebook is the only first-hand account that he could find and that has survived of a World War I film cameraman who accompanied the Austro-Hungarian army during the First World War. Denkmayr's study was written while we were researching Dawson and has a number of references to our article for Film History journal. Here is a download link to Denkmayr's excellent thesis for the University of Vienna in 2012. In his diary Dawson describes how he gained access to the frontline in the summer of 1915 and covered the attack on Ivangorod in Russian Poland. All photographs with an asterisk in this magazine were taken by Dawson. His original notes were translated into German for this publication. Because of its unique and historical value we have scanned and uploaded all five articles by Dawson from his war diary. You are free to read and download his own story here. Ernest Brooks, the first official British photographer in World War I, featured in a special episode of the YouTube channel The Great War that was broadcasted in October 2016. Ernest Brooks' photos from World War I have become icons of the entire war and are even recognized today. But his experience as an official war photographer was not always glorious and especially in the beginning he staged photos instead of showing the real horrors of the war. But as the war dragged on, more and more photos by Brooks captured small moments in this gigantic conflict that showed the humanity behind the numbers. 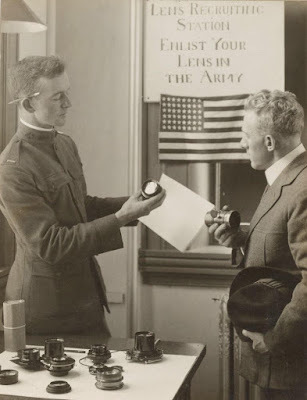 You can watch the episode on Brooks photographic work in World War I here on this weblog. You can subscribe to this interesting YouTube show on the Great War and watch a new video report on the First World War every Monday, Thursday and Saturday.